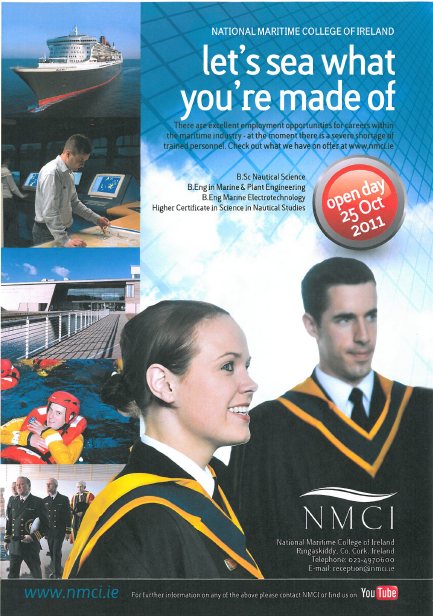 The Maritime Event and Open Day will take place at NMCI on Tuesday, 25th October 2011from 10:00 to 15:00. Representatives from international shipping companies and maritime organisations will be available to provide information about careers in the maritime industry. These companies provide employment and sponsorship to students undertaking courses offered by the National Maritime College of Ireland. Tours of the state of the art training facilities at the college including the multi-million euro ship and simulators, including our bridge simulator plus sea survival centre and engineering workshops.